Mangaluru, April 26, 2017: Missionary Society of Infant Jesus, was founded here by a Mangalorean priest Rev Fr.Lawrence Pinto, of Diocese of Lucknow, UP, in Mangaluru, often called ’Rome of the East’, the mother house of this order located in Bondel parish is closely supported by the Mangalore Diocese it’s Bishop Rev.Dr.Aloysius P D’Souza, the clergy, religious and laity, apart from the diocese of Lucknow, it is stated in a statement from the founder of this new order set up in 2005. The first two members of this catholic congregation will be ordained to the priesthood (Guru Deeksha) of the church by Rev Dr Aloysius Paul D’Souza today at Bondel church at 10.30 am. It is expected to be a land mark event in the history of the church here. A full report will soon follow on this page. 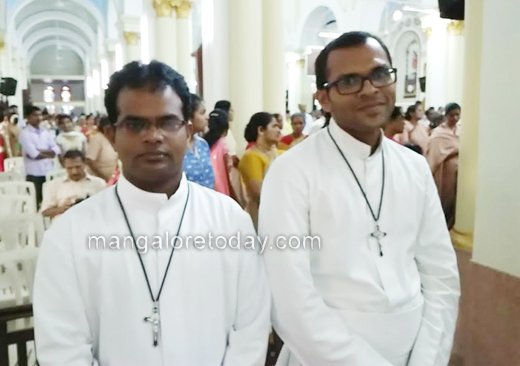 First Fruits of the MSIJ : Deacon Ravi Kumar Bathula and Deacon Melwin Basil Pinto are the first fruits of this congregation. Deacon Melwin did his diaconate ministry at St. Joachim Church, Kadaba and Deacon Ravi Kumar has been doing his diaconate ministry at Bondel Church. positive signs that this trend of grace will enlarge in the times ahead.